How to lose fat of your problem areas and get super toned!!! I get asked how to do the above all the time. It’s probably one of the most commonly asked questions any PT gets. Whether it be bum, thighs, belly or arms people always want to know how to get rid of the fat in these specific areas. Well I’ve got some bad news for you. Spot fat loss isn’t a thing. Nothing you do will cause you to lose fat of a specific area. The reason for this is quite complicated but I’ll try my best to make it simple. The parts that people want to lose this fat off are normally their worst areas. This means that they are your body’s preferred and first place to store fat. 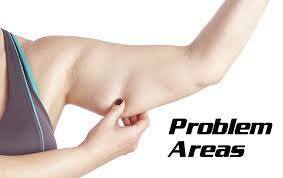 Hence, these areas are therefore bigger than the parts your not so concerned about because there’s more fat there. Again there’s no way to change this. unfortunately it’s genetic and partly evolutionary. It’s just the way you are. Like the colour of your eyes it ain’t going to change. So, how can you improve these areas. Well the first step it to begin to lose weight. The thing here is, when you lose weight it first comes off your body’s least favourite places to store fat. Think hands, arms and other areas that are very rarely flabby. Again this may be different from person to person. This means that in order to trim down these ‘worst’ bits you must first lean out everywhere else because only when you have lost weight off all the other bits will your body tap into its favourite reserve. I know this probably isn’t what you want to hear but this means it’s a long process. There is no quick fix to lose fat of specific areas of the body. The good thing is now you know this; you can accept that it isn’t going to happen overnight. It’s going to take time and dedication but at the end of it you’ll get to where you want to be. what’s important is the process of getting there. Although you won’t be able to lose fat of specific areas you can certainly improve there appearance by building muscle under the fat in those areas. Ps. No you can’t turn fat into muscle. Just no. But that’s a blog for another day. This is particularly effective in people who don’t already do resistance training as it’s unlikely experienced trainers will gain any muscle whist in a calorie deficit. By incorporating weights training into your regime you will build a shape that will ultimately help these areas look better whist your in the process of losing the fat. This is what people commonly refer to as getting ‘toned’ but it’s important to understand the different individual process involved in achieving this look. You aren’t going to start doing a magic exercise that strips away your belly fat and gives you abs in a few weeks. It just doesn’t work like that. However, can you achieve the ‘toned’ look your desperate for by applying the above processes over a much longer time frame. Hell yeah. You can even do without cutting out your favourite foods! But to find out that secret you’ll have to pop in to see us. → Your Goals or Theirs?? ?